Malik Sanders puts up the final shot over Derik Brady (#33). Derik Brady earned free throws with seven seconds left (he made one of two) after rebounding a missed Green Wave free throw. (Danbury) New Milford (1-1) came up with crucial rebounds in the last minute and hung on to edge Danbury (1-3), 48-45, on Thursday night at Danbury High School in nonleague action. 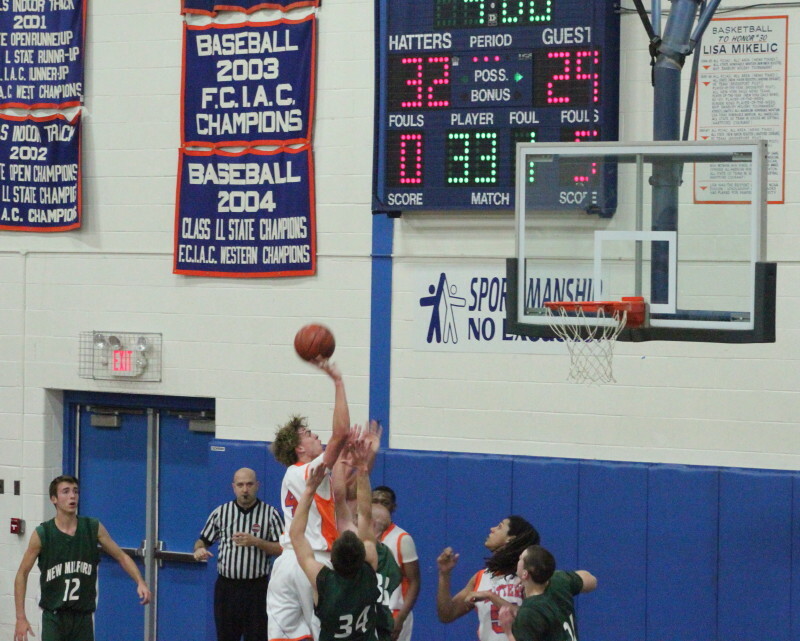 Inability to secure a rebound on missed Green Wave free throws bit Danbury twice late. Another costly rebounding blunder allowed Angel Vasquez (smallest player on the floor) to come up with a rebound in the midst of several taller Danbury players. With extended possessions and extra free throws the Green Wave put together enough for the win. However, the outcome hung in the balance as Malik Sanders got a good look at game-tying three over Derik Brady at the final buzzer. 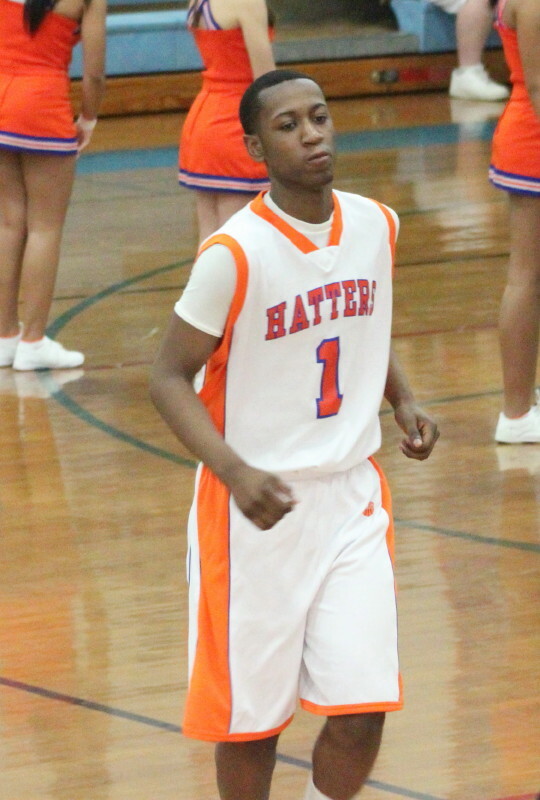 The Hatters started slowly partly due to losing Malik Sanders in the first two minutes thanks to two charging calls. The visitors got up 9-2 on a seven-point run featuring a trey from Derik Brady. The Hatters fell further behind (21-12) after a three by Steven Cronin and a free thrown from Thedore Augeri after four minutes in the 2nd quarter. The next seven minutes (stretching into the 3rd quarter) were all Danbury. 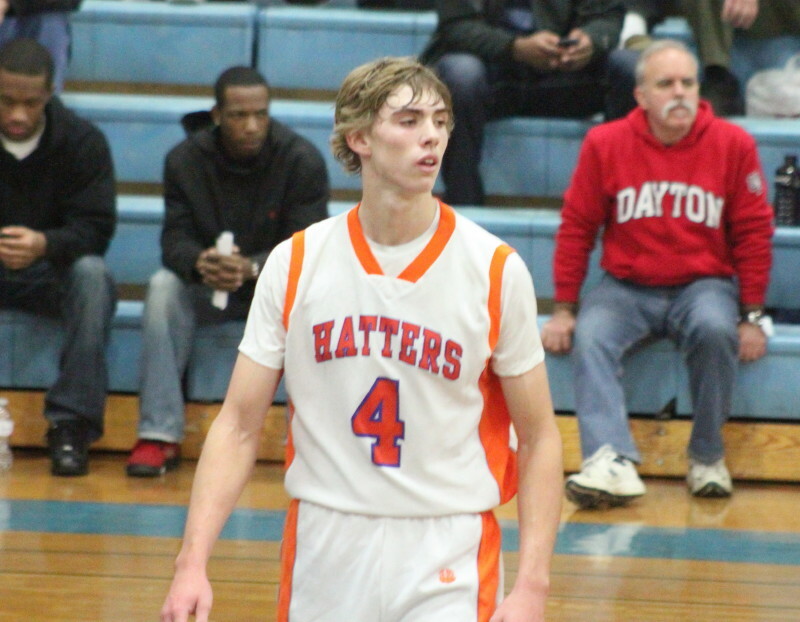 They outscored New Milford 20-4 with free throws (8) and layups. From where I was sitting, their 32-25 lead looked likely to grow the rest of the way. Didn’t work out that way. The Green Wave went 9-2 the rest of the quarter which ended tied at 34. Steven Cronin (#12) finished with nineteen points. Here he’s defended by Dan Grenier. 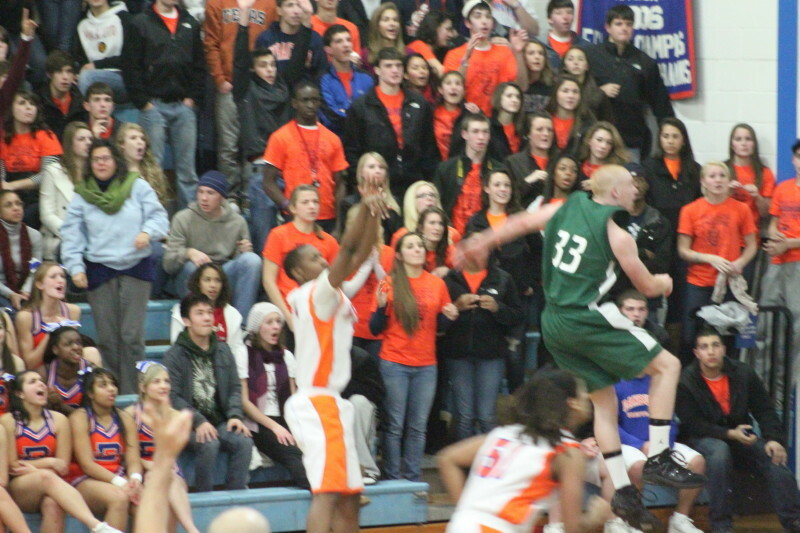 Danbury went up 41-38 thanks to a trey by Dan Grenier and a fast-break layup from Corey Dean after two minutes. 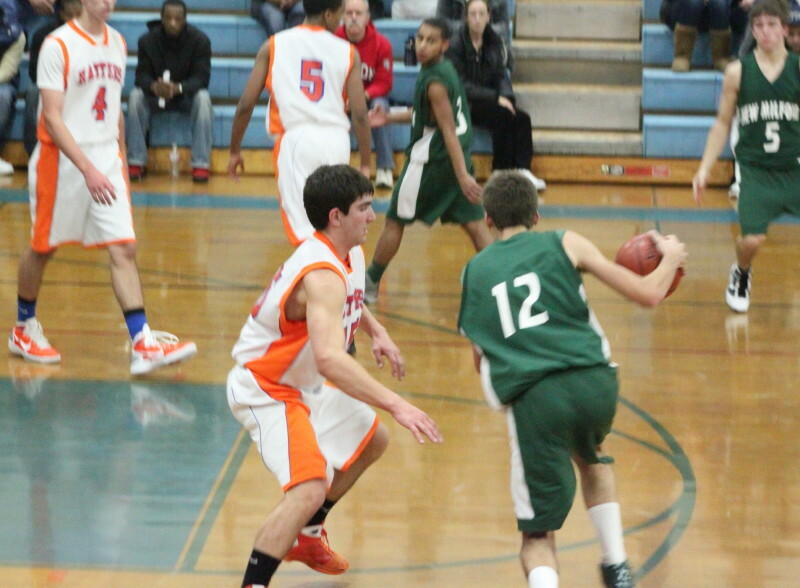 New Milford started to spread the court on offense and get Steven Cronin to the basket. Twice he spun and escaped from close-in shots. The go-ahead basket was on a nice feed from Angel Vasquez that gave New Milford the lead for good, 44-43, with 1:10 left. Danbury had a couple of free throws (Corey Dean) the rest of the way but subpar rebounding technique and three missed game-tying attempts cost them a chance to win. 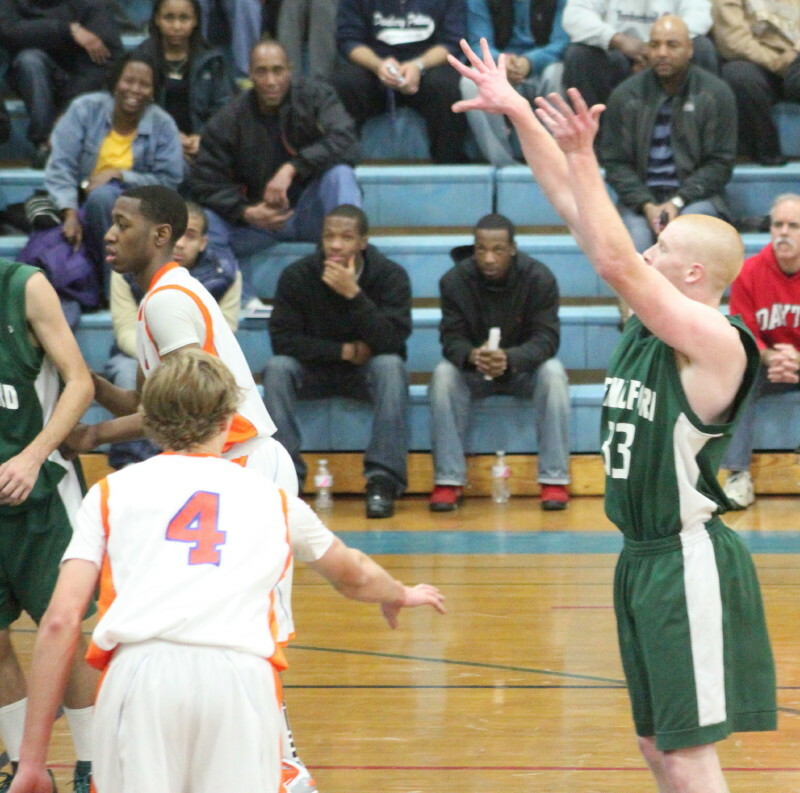 New Milford played zone nearly the entire game to offset Danbury’s size and interior athleticism. Corey Dean (20 points) goes high above Green Wave defenders to score in the 3rd quarter. Corey Dean (20 points) hurt New Milford any time he got the ball close to the basket. That zone and early foul trouble cut into Malik Sanders normal numbers – he had 28 points a game ago. Steven Cronin (19 points) took over for New Milford down the stretch. I haven’t seen much Connecticut basketball so I was taken by surprise by the lack of a shot clock. There were several times where each team just held the ball letting the clock run.